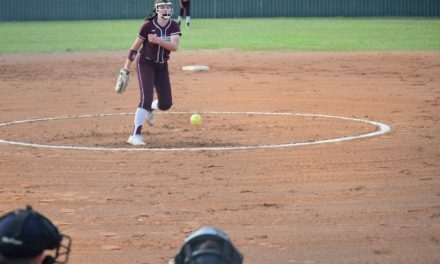 LOVELADY – Lovelady Lion Blake Johnson became the latest in a string of area athletes to sign a national letter of intent to take his talents to the next level. 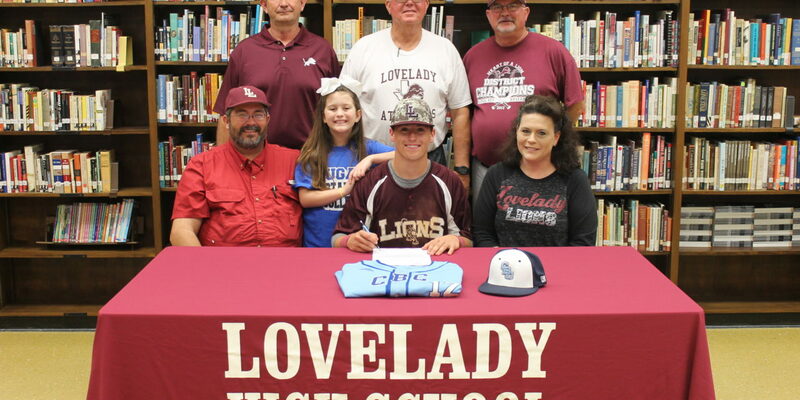 The Lions’ first baseman inked his name to play college baseball with the Coastal Bend College Cougars in late February and while the ink was drying on his commitment, he spoke about what this meant to him. “My first thoughts were all the hard work I had put in and all the extra work had finally paid off. I’m not the most athletic guy out there. I’m not the fastest nor am I the strongest. But, it says to me, if you work hard, you can get it done,” he said. “It was the extra hours in the (batting) cage after practice. It was all the extra laps around the field after practice. It was all the extra ground balls I took when I got home. It was the extra hours of tee work in the cage. It all seemed to really pay off when I signed that piece of paper,” Johnson added. He explained while he was about to become a third generation Coastal Bend Cougar, there was more to it than just that. Coastal Bend College seemed to be the right fit, he said. Johnson said he had watched the Cougars in action when he was younger and added he felt at home when he visited the Coastal Bend College campus. 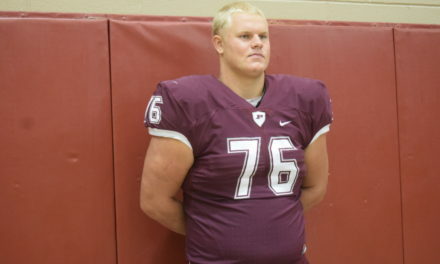 “I liked the way the coaches treated me and I got along with the guys that were already there. I can’t even count the number of friends from that team I met while I was down there during that tryout. I know they will be going off to major universities a couple of states away, but I know I can call them and ask any questions I might have. It felt very natural going down there to play and believe that they could be my next baseball family,” he said. Coastal Bend is a junior college located in Beeville which had disbanded the baseball team but had re-launched the program around the 2009-2010 timeframe. “They’ve had some guys in the last few years that have gone on to some pretty big universities. This past year, the team had four guys who went to some good sized programs in Oklahoma and Texas. This college is the one which I felt would give me the chance to showcase all the hard work I’ve put in,” he said. While most players at the JUCO level desire to play at the D-1 level, Johnson explained while he was no different, he would also appreciate an opportunity to play for a university like Sam Houston or Stephen F. Austin after he finishes his tenure at Coastal Bend. 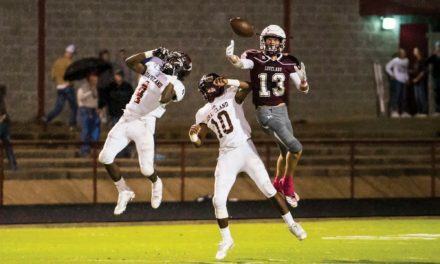 “My goal is to play for any college that gives me a chance to play and live out my dream,” he said. As to what he would tell others seeking to continue their athletic careers after college, Johnson said the key was hard work. “You might not want to put in that extra lap after practice. 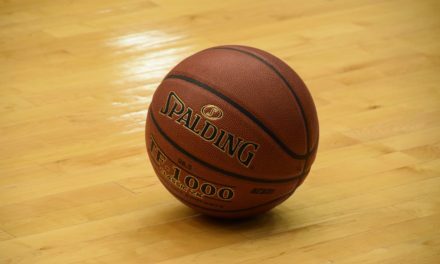 You might not want to hit that extra bucket of balls after practice, but once you do, make sure you put 100 percent into it. There will be a set of eyes on you the whole time. One day, your work might not get recognized but the next day the phone might ring and it could be someone who says ‘Here’s our offer. Are you going to take it?’ All the hard work will pay off. You just have to wait and be patient for it,” he said.